Does it help to rub a bruise? Margaret asks: My Mum used to say if I knocked myself "rub it better". Was that just a diversionary tactic or is there something in it? James - So a bruise is I think what’s being referred to here. So bruises are really bleeding underneath the skin. When you bang yourself on the desk, bang your knee on the desk what happens is the very small blood vessels can rupture because of the force of the impact. This blood accumulates underneath the skin and causes inflammation and swelling of that area. 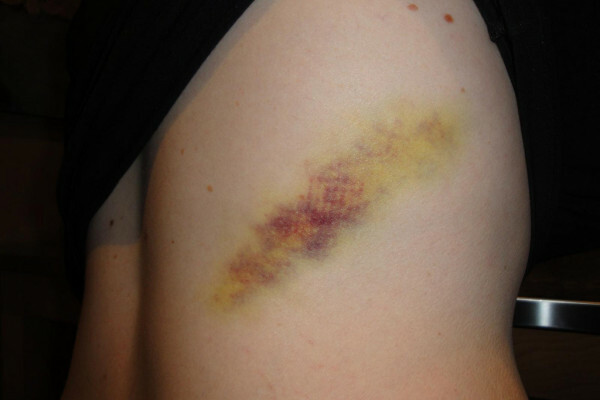 If you observe the area every few days you’ll notice that the colour of the bruise changes from, initially, a sort of deep blue, to more of a brown, to more of a yellow. And that’s really because the elements of the blood, the iron, the haem, is being changed and oxidised with time. Now as for rubbing the bruise and making it better; I did look into this because I hadn’t actually heard this ‘old wives' tale’ before but I think it is just that, it’s an old wives' tale. Part of the defensive mechanism of the body is to stimulate that inflammation when you bang yourself so the swelling is protective really and helps the body break down the blood that’s got into the tissues. Rubbing it as a good distraction certainly and with my toddler at home, if there is a bruise a good rub on the knee and some chocolate perhaps certainly diffuses the situation. But I don't think there’s any effect there. Previous Is there more than one Universe? Next How much does a single cell weigh? What happens to bruise as it disappears? I rub mine even though it is painfully. I think it hurts but feels good. I bruise easy and right now I have BB eye from when I fell and I hit my head. I have the blood and inflamtion under the eye and I took a TP inner, and roll it in different directions mom area. It hurts good and has helped with the inflammation and coloring. Try it your self. If you have a couple of small bruises, rub one only. Judge for yourself. Which one dissappears first? Massaging gently helps encourage the blood flow in the inflamed area. It absolutely works. What works teally werll is rubbing it using a brush. This actually works, I know as I have to take a small daily dose of aspirin and bruise easily. If I rub the affected area a few times (over a few hours) the bruise dissipates and fades much faster then without rubbing. Try it yourself.